Toes tapping. Hands clapping. We’ve got the tunes in Coastal Alabama and you’re invited to the show. Live music provides your coastal soundtrack in Gulf Shores and Orange Beach. The Mobile Symphony Orchestra creates an environment that allows for the presentation of the finest quality music. The orchestra has performed in the historic Saenger Theatre since 1997. Mobile’s Downtown music scene is epic, with long-standing favorites like the grand and opulent Saenger Theater, or downtown hip, cool or jazzy favorites like Callaghan’s Irish Social Club, The Haberdasher and The Listening Room. There’s also the newest music fest on the scene, Downtown Mobile’s 1065 Music Festival. SouthSounds Music and Art Festival is the first festival of its kind in the country that focuses on upcoming and emerging Southern musicians across all genres, held the second weekend of April each year in historic downtown Mobile. 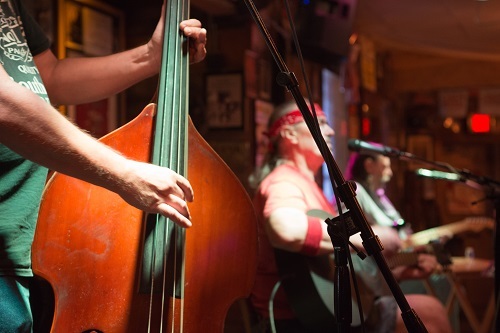 Touted as being America’s “Last Great Roadhouse,” the Flora-Bama Lounge and Oyster Bar is the perfect place to kick back with a one of their infamous bushwackers in-hand and enjoy a day and/or night filled with live music. From locally to nationally-recognized artists, the Flora-Bama attracts artists all 365 days out of the year. Known for its nationally-acclaimed May Hangout Music Festival, The Hangout in Gulf Shores hosts live, local bands year-round. Their fun, family-friendly environment and engaging crowd activities makes it a great musical outing for both children and adults. The Wharf is one of the Gulf Coast’s most inviting shopping and dining destinations with exciting entertainment, tournaments, car and boat shows and other unique events. Top it all off with one of the coolest, bay-side outdoor amphitheater, and there’s no wonder it brings in the biggest music acts in the world—Grammy award winners and long-time favorites. Big city concert halls have nothing on its line-ups.